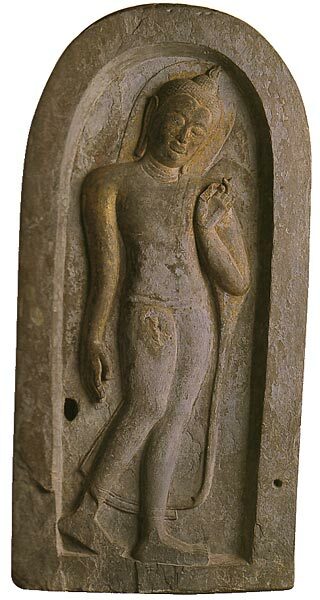 While in the yoga posture, the Buddha has his right hand positioned on the knee, holding a mango. The Buddha performed a miracle while staying at Veluvana. Some heretics 'demanded' a miracle for him to prove his powers. The Buddha pressed the mango into a bowl, drank the juice, then had the mango seed planted. Immediately, a large tree grew, with plenty of fruit. 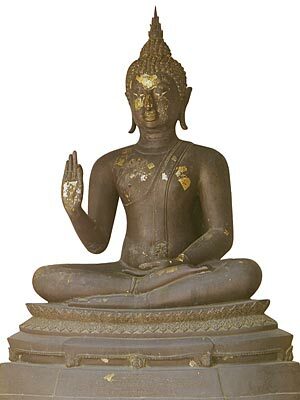 Right hand in Vitarka Mudra, while the Buddha is seated in the European or Western fashion. 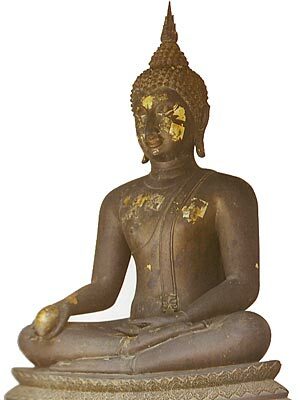 Another variant shows the Buddha standing. The Buddha demonstrated his powers to non-believers at Sravasti. He displayed a celestial aura, caused earthquakes and storms. He also caused a replica of himself (Double Apparition). [variant] The Buddha descended from Tavatimsa heaven, and performed a miracle whereby the three worlds were joined together, and the inhabitants of each could see one another. Indra creates three staircases, one for himself, one for the Buddha, and one for Brahma.